Secondary Operations | Accudyn Products, Inc.
Accudyn offers a range of secondary operations and capabilities at both our Erie, Pa., and Chihuahua, Mexico facilities. These secondary operations reflect our strong focus on providing full-service injection molding solutions for our customers’ plastic product needs. No matter the design requirements, Accudyn’s team offers the expertise and services to make your project a success. To transfer unique molding & tooling technology to our Chihuahua, Mexico location in response to growing customer interest. While radiator and charge air cooler (CAC) end tank molding has long been a core technology in Accudyn’s Erie location, it was not a product line that was molded in our Chihuahua Mexico plant until recently. Our customer base was looking for a solution and Accudyn met the challenge. To ensure we covered all the bases, we assembled a joint team from both locations to work on this technology transfer that included tooling, processing, and quality representation. The team met over the course of several weeks to cover all aspects of molding radiator and CAC tanks and traveled to both plants to do hands-on training in processing, troubleshooting, and part measurement. The success of this technology transfer has expanded our ability to meet our customers’ expectations and gives them more options when looking for a partner that can meet their requirements for end tank molding. Expanding our technology across locations at Accudyn gives our customers the right solution where they need it. Scroll left/right to see more results. Develop an injection moldable solution to problematic, extruded product line with high scrap rates. Our customer’s product line was a high-end offering to their customer base that demanded high quality. This product was both aesthetic and functional, adding to the beauty of the customers home and keeping rain and weather out. The product was assembled from a co-extrusion that was mitered and glued together. To achieve the level of quality that was consistent with this being a high-end product required a pain staking assembly process that resulted in a very high scrap rate. The performance of the product was also problematic with the seal not performing consistently causing numerous customer complaints and warranty claims. Working closely with our customer’s engineering and marketing teams, Accudyn’s engineers helped develop a product design that met all the customer requirements. We also developed both a tooling and manufacturing strategy in conjunction with the part design to ensure we could meet their requirements consistently in a production environment and minimize their tooling investment. The resulting improvements to this product line for our customer have been a complete success. 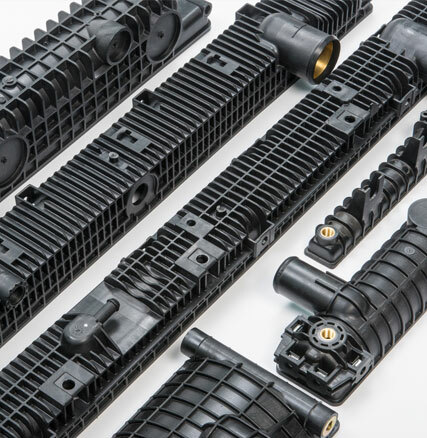 The performance issues related to the co-extruded manufacturing process have been eliminated completely and visually, the injection molded product is a clear improvement that the customer’s marketing department predicts will increase their sales. One more thing, it costs less too! Making a dramatic change to a key product including the entire manufacturing process is challenging and not without risk. Partnering with Accudyn on these difficult projects ensures that all the details will be considered and addressed. To re-engineer a complex part and a molding process for a problem component. Our customer’s actuator case was a difficult, expensive molded part that was not meeting their cost, quality or functional requirements. They went looking for a solution and found it at Accudyn. 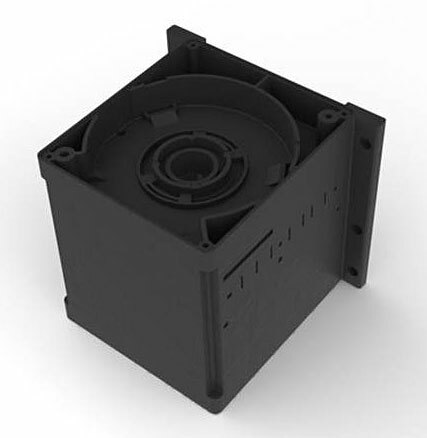 Working closely with the customer’s engineers, we identified the key functional requirements of the part that were not being met, along with several issues with the current mold and part designs. Using Moldflow Analysis software, Accudyn was able to show how the gating method in the current mold was contributing to the quality issues they were experiencing. We were also able to demonstrate how our recommended solution would give them a more robust, repeatable process resulting in a more consistent part that met their quality requirements. With a full understanding of how the part is used we also recommended a material change that resulted in a significant price decrease for the customer. 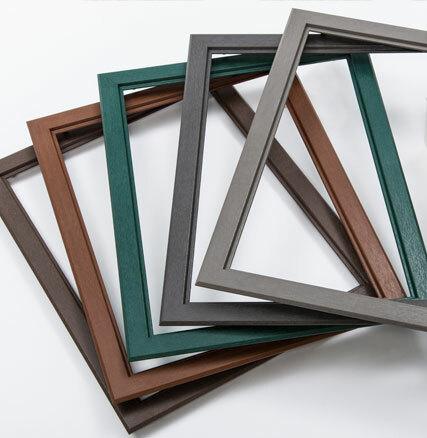 The resulting part was a dramatic change for our customer, giving them a part that consistently meets their requirements and is more cost effective. Part & Process design is where true value is added. If you have a problem part that needs an engineered solution, let Accudyn show you how.